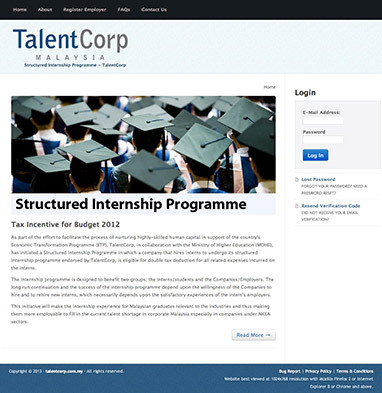 The Structured Internship Programme is a collaborative programme between Ministry of Higher Education (MOHE) and Talent Corporation Malaysia Berhad (TC). The internship programme is designed to benefit two groups; the interns/students and the Companies/Employers. The long run continuation and the success of the internship programme depend upon the willingness of the Companies to hire and to rehire new interns, which necessarily depends upon the satisfactory experiences of the intern’s employers. We were commissioned by Talent Corporation (M) Berhad in 3rd quarter of 2011 to develop an online application system to provide an access point for qualifying companies to provide their proper documentation for screening purposes via the portal.